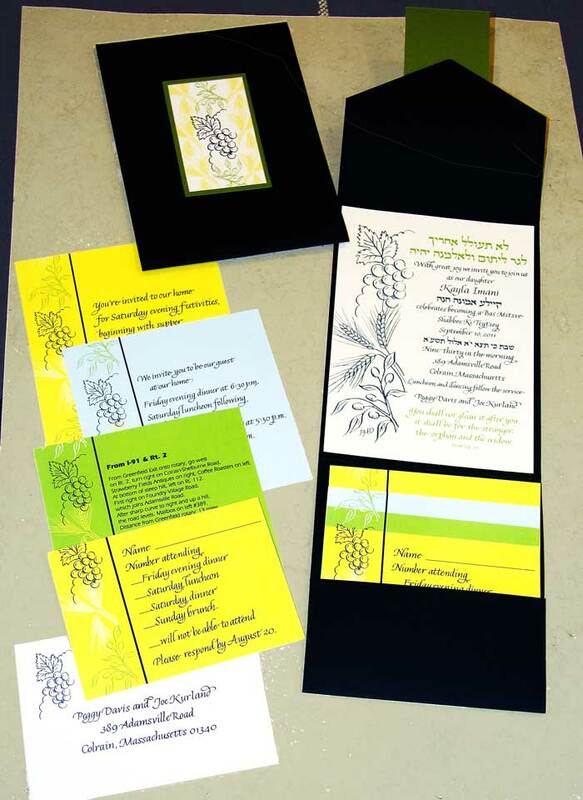 One of the invitation printers I use offers a three-color digital printing process: two ink colors plus the color of the paper (white or ecru) to make up the design. The pricing is comparable to other printers I use. 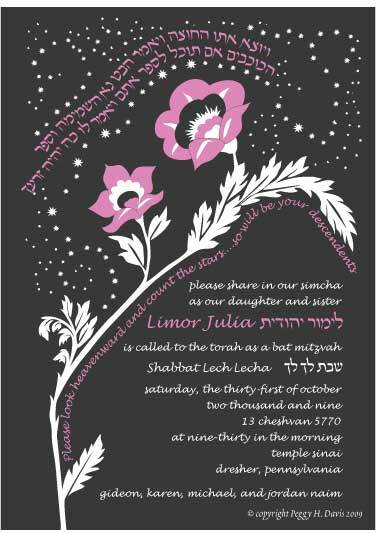 Here is an example of an invitation set I designed for this process. 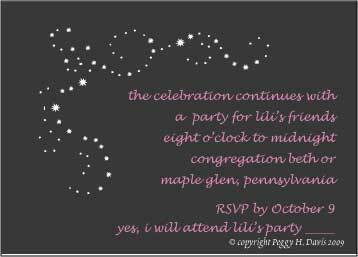 Most of the invitations that I produce for customers are custom designs. Even if it is based on a design already in my collection, there is usually some customization that goes into the final product. It can be a smooth process, and the following pointers will help you get started. 1) The invitation will convey to your guests a sense of what the event will be like: casual, meaningful, formal, intimate, are words that you might think of. 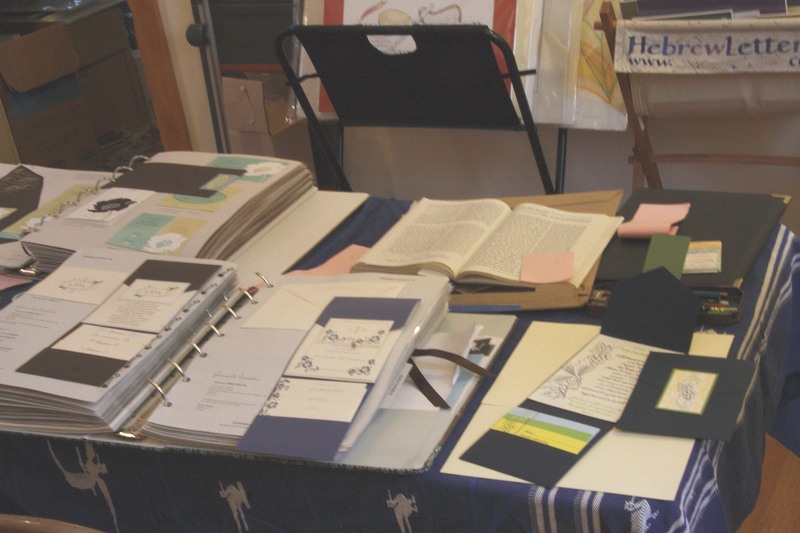 When we start talking about the choice of paper, the colors, images, lettering, size, shape, these will all relate to what you want to communicate. Bring these ideas to the first discussion of the project. • The invitation itself, with a single or more formal double envelope. A double envelope set has an inner envelope that is addressed with just the name(s) of those invited at that address. The envelope (or inner one of a double set) may have a liner which relates to the design of the invitation, using a particular color, pattern or texture of paper. • A save-the-date card or postcard that would go out well in advance of the event; it could include hotel reservation information. • A respond postcard or card with envelope. This should request that guests include their names, number attending, and, if needed, entrée choice(s). It is also nice to leave some empty space for a note. 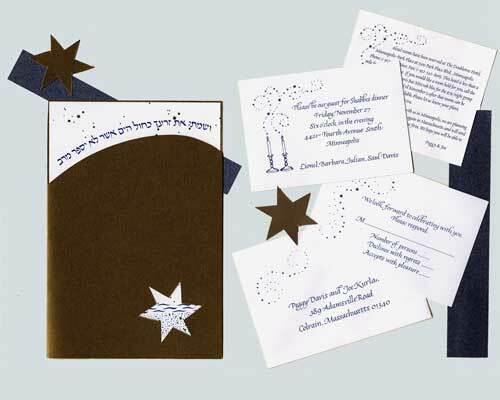 • Reception cards: These may be used to invite a guest to a Friday evening dinner, a rehearsal dinner, a Sunday brunch, an evening party for a morning Bar or Bat Mitzvah, etc. You may need two or three such cards, but they may not all be ordered in the same quantity. For example, you may send 100 invitations, but only 30 may be for out-of-towners, who might be the only ones invited to a Sunday brunch. • Directions and hotel information: One card may include directions to the event and a reception; the directions may give instructions from a few locations. Hotel information may be on a separate card or one the reverse of the directions. 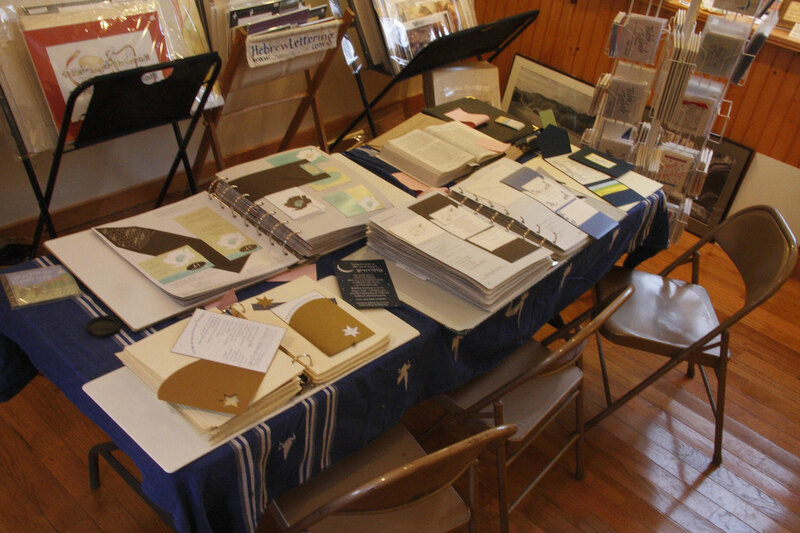 • Gift registry, charitable donations: You may want to inform guests of gift registries. If you are starting a marriage with two full households, you may use a card to indicate a preference of charitable contributions on your behalf. Some Bar or Bat Mitzvahs will indicate a place to make a donation if that is the kind of gift you are giving. • Placecards: There are many ways to indicate where guests should sit; one way is to use folded cards with the guests’ name(s) and table number. • Table numbers: We make table numbers (or sometimes a thematic table name) for an event that use elements of the invitation design. • A favor tag or label can be designed to tie to or adhere to favors you give your guests. 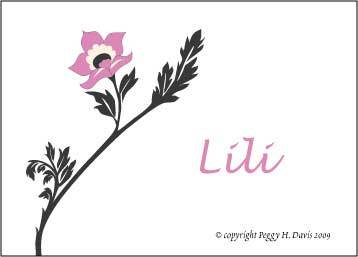 • Thank you note and envelope: Usually a folded card with the name(s) of the wedding couple or Bar/Bat Mitzvah. 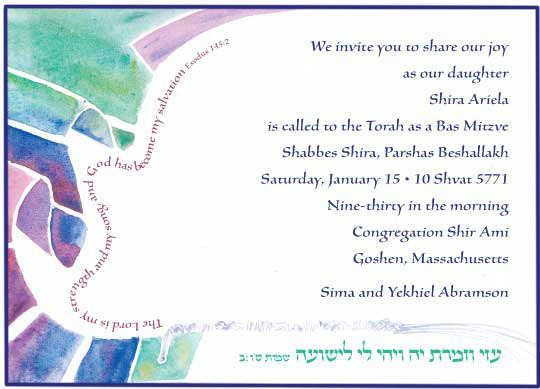 I often include a design element from the invitation. 3) Don’t underestimate how much time it will take to get the address list in order. Printing the invitation will take about a week, so you want to be working on that list while we’re designing the invitation. 4) Timing: Most people plan to send the invitations 6-8 weeks before the event, although some customers report that number is creeping up. Allow two weeks for printing. That means that an ideal time to start discussing the order is 4–5 months before the event. We can produce invitations in whatever time you have, but this is a comfortable margin.